When you hear the name Accrington Stanley you are more likely to think of a famous advert for milk than one of the best football teams in the world. However, after Tuesday's 3-2 victory over Notts County in League Two, Stanley manager John Coleman compared some of their play to that of Spanish giants Real Madrid - with a bit of Sunday league thrown in too. "We played like Real Madrid for 25 minutes and then Reality Madrid in the seventh division of the Hackney Marshes League," Coleman told BBC Radio Lancashire. "As a manager sometimes you just can't put your finger on it." Billy Kee's early goal and a brace from Rommy Boco helped Accrington into a 3-0 lead before strikes from Ronan Murray and Adam Campbell ensured a nervy finish at the Wham Stadium. Victory moved Accrington up to fourth in League Two, three points off the automatic promotion places, though Coleman's side have two games in hand on the teams above them. Since their reformation in 1968, Stanley have never reached the third tier of English football. 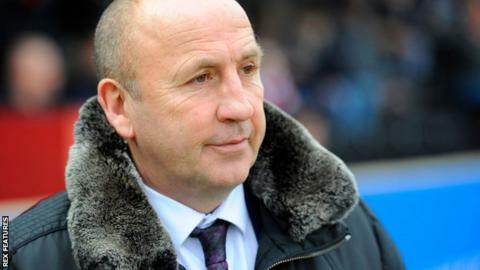 "It's not mixed emotions, I'm absolutely furious," added the 53-year-old former Rochdale boss. "I'm furious because that we let each other sink miles below our standards. "From an absolutely terrific first 25 minutes where we were irresistible, we stopped playing and they smelt it. "On another day they would've got a draw or maybe a win - we weren't clinical enough and we didn't put enough effort in."